Disuse muscle atrophy occurs in response to pathologies such as joint immobilization, inactivity or bed rest. Muscle disuse is accompanied by an increase in apoptotic signaling, which mediates some of the responses to unloading in the muscle. GB34 (Yanglingquan) is a acupuncture point on the lower leg and one of the most frequently used points in various skeletomuscular diseases. In this study, the hypothesis that the acupuncture at GB34 could attenuate immobilization-induced skeletal muscle atrophy was tested. The left hindlimb immobilization was performed with casting tape in both GB34 group (n=10) and Control group (n=10). The rats in GB34 group were daily treated with acupuncture at GB34. After 2 weeks of immobilization, the morphology of right and left gastrocnemius muscles in both GB34 and Control groups were assessed by hematoxylin and eosin staining. To investigate the immobilization-induced muscular apoptosis, the immunohistochemical analysis of Bax and Bcl-2 was carried out. GB34 group represented the significant protective effects against the reductions of the left gastrocnemius muscles weight and average cross section area to compared with Control group. The acupuncture at GB34 significantly reduced the immunoreactivity of BAX and increased the immunoreactivity of Bcl-2 in gastrocnemius muscle compared with Control group. These results suggest that the acupuncture at GB34 has protective effects against immobilization-induced muscle atrophy by regulating the activities of apoptosis-associated BAX/Bcl-2 proteins in gastrocnemius muscle. 골격근위축(skeletal muscle atrophy)은 다양한 환경에서 유발되는데, 근육에 가해지는 저항이 없거나 신경활성이 감소되는 경우를 일반적으로 ‘불용성 근위축(disuse muscle atrophy)’이라 부른다1). 불용성 근위축은 결과적으로 뚜렷한 근육량의 감소와 수축력의 감소를 야기하며, 실제 임상에서 흔하게 제기되는 문제이다2). 특히 최근 노령인구의 증가에 따라 주목받고 있으며, 오랜 기간의 침상생활이나 운동부족, 그리고 노화에 의한 근육량의 손실과 기능저하는 삶의 질의 저하뿐 아니라 노령 환자의 사망률을 증가시키는 원인이 되기도 한다3). 하지만 아직까지 불용성 근위축의 치료법에 대한 연구는 부족한 것이 사실이다. 근육을 장기간 사용하지 않으면 근육 내 단백질 합성이 저하됨과 동시에 단백질 분해가 촉진됨으로써 근육 감소가 나타나게 되는데, 이러한 단백질 생성과 분해의 불균형의 원인이 되는 요인들 중에 특히 reactive oxygen species (ROS)의 생성이 단백질분해효소(protease)를 활성화시켜 항산화 단백질을 감소시키고 동시에 단백질 합성을 촉진시키는 세포기전을 억제하는 것으로 알려졌다4,5). ROS의 과도한 생성은 DNA fragmentation, lipid peroxidation과 protein oxidation을 일으키며 결과적으로 세포의 apoptosis를 유발할 수 있다6). Apoptosis는 세포사멸과 조직재생, 그리고 여러 생리학적인 항상성을 유지하는 데 필수적인 과정인데, 근육을 오랜 기간 사용하지 않거나 혹은 노화에 의한 자연스런 근육 감소의 과정에서 apoptosis가 활성화되거나 가속화되는 것으로 알려졌다7,8). 인체의 경혈(經穴) 중에서 양릉천(GB34)은 <난경(難經)>에 근회(筋會)로 기록되어 있으며, 팔회혈(八會穴) 중에서 근회혈(筋會穴)이다9). 양릉천은 활혈통락(活血通絡), 서근맥(舒筋脈), 소경락습체(疎經絡濕滯)의 효능을 가지고 있어서 다양한 근골격질환, 신경계질환 및 각종 내과 질환에 사용되는 경혈이다10). 양릉천 자침 효과에 대한 실험적 연구로는 흰쥐 근피로에 미치는 개선 효과11), 흰쥐의 신경병리성 동통에 미치는 영향12,13) 등이 보고되었으며, 또한 양릉천 약침이 흰쥐에 고지혈증에 미치는 효과14), 저주파 전침자극이 흰쥐의 간손상에 미치는 영향15) 등이 보고되었으며, 임상적으로는 특발성 파킨슨 환자에 미치는 효과16), 하지 근육의 근피로에 대한 회복 효과17), 뇌성마비 환자의 불수의적 운동에 대한 조절 효과10) 등이 보고되었다. 이렇듯 양릉천은 다양한 전신질환에 효능이 있으며, 특히 근육과 관련된 광범위한 질환에 사용되고 있음을 알 수 있다. 하지만 불용성 근위축에 대한 양릉천의 효능에 대해서는 아직 연구된 바 없다. 이에 본 연구에서는 흰쥐의 발목관절을 2주간 붕대 고정하여 불용성 근위축을 유발시키고, 2주간 매일 양릉천에 자침하여 불용성 근위축에 미치는 효과를 검증하였다. 이후 실험 동물의 2주간의 체중 변화, gastrocnemius 근육의 중량 및 근섬유 단면적 변화, 그리고 산화적 손상에 관련된 지표 및 관련 단백질 변화를 측정하여 유의한 결과를 얻었기에 이에 보고하는 바이다. 본 연구에서는 (주)샘타코(Samtako Inc., Osan, Korea)에서 구입한 10주령, 약 250 g 전후의 Sprague-Dawley계 수컷 흰쥐 20마리를 사용하였다. 흰쥐는 온도 23∼24℃, 습도 40∼60%, 조명 12시간 명/암이 자동적으로 유지되는 사육실에서 무균 음수와 사료를 자유롭게 공급하여 사육하고, 실험실 환경에 1주 이상 적응시킨 후 사용하였다. 본 연구의 모든 과정은 동의대학교 동물실험윤리위원회의 규정 및 방침(A2018-004)에 따라 진행되었다. 실험군의 분리는 흰쥐를 무작위로 10마리씩 나누어 아무 처치도 가하지 않은 Control과 양릉천 자침을 시행하는 GB34군으로 분리하였다. 물과 사료는 모든 군에서 전체 실험 기간 동안 자유롭게 섭취할 수 있도록 하였다. 본 연구에서 실험 동물에 인위적인 불용성 근위축을 유발하기 위해 Udaka 등18)의 방법을 참고하여 흰쥐의 후지에 붕대고정(cast immobilization)하는 방법을 사용하였다. 흰쥐에 만성 불용성 근위축을 유발하기 위해 휜쥐의 왼쪽 발목관절을 완전히 신전(extension)시킨 후 casting tape (type 82002A, 3M, Maplewood, MN, USA)를 이용하여 발목관절을 움직이지 못하게 하였다. 발목관절에 대한 붕대고정은 2주간 유지하였으며, 실험 기간 동안 오른쪽 발목에는 아무런 처치도 하지 않아서 자유롭게 움직일 수 있게 하였다. 경혈 자극은 GB34군의 흰쥐의 왼쪽 후지에 Sterilized disposable acupuncture needle (0.25×30 mm, Dongbang Medical, Seongnam, Korea)을 이용하여 인체의 양릉천(GB34)에 상응하는 위치에 2–3 mm 깊이로 자침하고 30초간 유침하였다19). 이러한 경혈 자극은 오전 오후로 나누어 같은 방식으로 2주간 매일 2회 시행하였다. 실험 동물의 체중은 실험 기간 동안 매일 오전 정해진 시간에 측정하였으며, 실험 마지막 날에는 부검 직전에 측정하였다. 실험 개시 2주 후 실험 동물을 안락사시킨 후 실험 동물의 gastrocnemius를 분리 채취하여 중량을 측정하였다. 근육의 무게는 실험 동물의 체중을 측정한 후, 체중 100 g당 근육 무게를 계산하였다. 이후 근육조직은 근육의 중앙부분에서 약 3~5 mm 정도 두께로 절편하여 –50℃의 dry ice-isophentan 용액으로 동결시키고 –80℃에서 보관하였다. 동결보관된 근육조직 중에 gastrocnemius의 중앙부분(mid-belly)을 연속적으로 8 μm 두께로 냉동절편하여 Hematoxylin and eosin (H&E) 염색법을 시행 후, 현미경하에서 관찰하고 사진촬영 후 영상분석용 Axiovision LE software ver 4.2 (Carl Zeiss Vision, Oberkochen, Land Baden-Württemberg, Germany)를 이용하여 근육 단면의 면적(cross section area)을 측정하였다. 각 실험군의 근섬유의 평균 면적은 각각의 근육조직의 최소 30개 이상의 근섬유를 관찰함으로써 측정하였다. 면역조직화학염색(Immunohistochemistry)은 자유부유법(free-floating)을 사용하였다. Primary antibody는 anti- BAX (ab7977, 1:200 dilution, rabbit polyclonal; ABcam, Cambridge, Cambridgeshire, UK), anti-Bcl-2 (sc-783, 1:200 dilution, rabbit polyclonal; Santacruz, Dallas, TX, USA)로 phosphate-buffered saline (PBS)와 Triton X-100 (SigmaAldrich, St. Louis, MO, USA)을 섞은 용액으로 희석한 후 4℃에서 12시간 반응시켰다. 이후 조직을 PBS로 씻어내고, abidin-biotin immunoperoxidase의 방법(ABC Vectastain Kit, Vector Laboratories, Burlingame, CA, USA)에 따라 각각 1시간씩 반응시켰다. 면역반응의 결과를 정량화하기 위해 현미경하에서 동일한 일정면적 내 핵 내에 명확하게 적갈색으로 염색된 세포 수를 세어 면역 양성반응으로 구분하고 세포 수를 측정하여 수치화하였다. 2주간의 실험 기간 동안 모든 실험군에서 시간이 지남에 따라 체중이 점차 증가하는 양상이 나타났다. 실험 개시 당시 각 군별 흰쥐의 평균 체중은 Control군에서 249.4±3.9 g, GB34군에서 250.8±6.1 g이었으며, 2주 후 마지막으로 측정된 체중은 Control군에서 355.1±9.1 g, GB34군에서 357.5±9.7 g으로 두 군 간에 유의성 있는 차이는 관찰되지 않았다. 실험 개시 2주 후 흰쥐의 양쪽 근육 gastrocnemius의 무게를 측정하고 체중 100 g당 근육 무게를 환산하여 비교하였다. 그 결과, Control군에서는 자유롭게 움직임이 가능하게 한 오른쪽 gastrocnemius 근육의 경우 516.3± 20.2 mg/100 g으로 측정된 반면, 발목관절을 붕대로 압박하여 움직이지 못하게 한 왼쪽의 경우 387.4±26.0 mg/100 g으로 측정되어 유의성 있는 감소가 나타났다(p<0.01). 오른쪽에 대한 왼쪽의 근육 무게의 감소량은 25.0±5.3%로 계산되었다(Table I). Effect of GB34 on Gastrocnemius Weights in Disuse Muscle Atrophy. Values are presented as mean ± standard deviation unless otherwise indicated (mg/100 g). The cast immobilization of left hindlimb resulted in significant reduction of gastrocnemius weight in both Control and GB34 groups. The mean weight of left gastrocnemius in the GB34 group was recovered to compared with that of the Control group. The mean ratio of left gastrocnemius to right in the GB34 group was also significantly recovered to compared with that of the Control group..
p<0.01 compared="" with="" right="" gastrocnemius="" p="">. p<0.05 compared="" with="" control="" group="" p="">. GB34군의 경우는 아무런 처치를 하지 않은 오른쪽 gastrocnemius 근육의 무게가 520.1±19.4 mg/100 g으로 측정되었으며, 발목관절을 고정시킨 왼쪽의 경우는 421.1± 22.6 mg/100 g으로 측정되어 Control군과 마찬가지로 유의성 있는 중량의 감소가 확인되었다(p<0.01). 오른쪽에 대한 왼쪽의 근육 무게의 감소량을 계산하였을 경우 19.0 ±5.4%로 관찰되었다. Control군과 GB34군의 근육량을 서로 비교해 보면 오른쪽 gastrocnemius에 대한 왼쪽의 감소율에서 GB34군이 Control군에 비해 근육 감소가 회복된 결과를 보였으며, 통계적으로도 유의성 있는 변화를 나타냈다(p<0.05) (Table I). H&E 염색을 통해 근육 단면을 관찰한 결과, Control군에서 왼쪽 gastrocnemius 근섬유의 크기가 오른쪽에 비해 현저히 감소된 것을 확인할 수 있었다. 또한 근섬유 주변에 핵(nucleus)의 응집이 뚜렷이 관찰되었다(Fig. 1). GB34군의 경우에서도 Control군에서와 유사하게 근섬유 크기 감소가 확인되었으나, Control군에 비해 감소가 상대적으로 적은 편이었으며 핵의 응집도 줄어든 양상이었다. Representative cross sections of skeletal muscle tissue (Hematoxylin and eosin [H&E] stain). 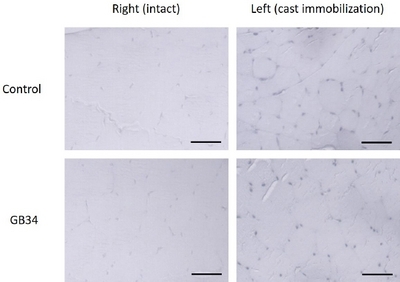 The cast immobilization decreased myofibers of gastrocnemius in both Control and GB34 groups. The accumulation of nuclei around the myofibers was observed. However, the reduction of left myofibrils in the GB34 group was recovered to compared with that of the Control group. Scale bar=100 μm. 200 magnification. 영상분석을 통해 gastrocnemius 근섬유의 단면적을 비교한 결과, Control군에서는 오른쪽 gastrocnemius 근육의 경우 4,506.7±144.5 μm2로 측정된 반면, 붕대고정을 시행한 왼쪽의 경우 3,616.9±136.5 μm2로 측정되어 유의성 있는 감소가 나타났다(p<0.01). 오른쪽에 대한 왼쪽의 근육 단면적의 평균 감소량은 19.7%로 계산되었다(Table II). Effect of GB34 on Cross Sectional Area of Gastrocnemius in Disuse Muscle Atrophy. Values are presented as mean ± standard deviation unless otherwise indicated (μm2). The cast immobilization of left hindlimb resulted in significant reduction of cross sectional area of gastrocnemius in both Control and GB34 groups. The mean area of left gastrocnemius in the GB34 group was recovered to compared with that of the Control group. The mean ratio of left gastrocnemius to right in the GB34 group was also significantly recovered to compared with that of the Control group..
B34군의 경우는 오른쪽 gastrocnemius 근육의 단면적은 4,513.3±213.1 μm2로 측정되었으며, 발목관절을 고정시킨 왼쪽의 경우는 3,804.6±144.3 μm2로 측정되어 Control군과 마찬가지로 유의성 있는 감소가 확인되었다(p<0.01). 오른쪽에 대한 왼쪽의 근육 단면적의 평균 감소량을 계산하였을 경우 15.6%로 관찰되어 Control군에 비해 근섬유 단면적 감소가 회복되었다. 즉 Control군과 GB34군의 근육단면적 감소를 비교해 보면 GB34군이 Control군에 비해 근육위축이 회복된 결과를 보였으며, 통계적으로도 유의성 있는 변화를 나타냈다(p<0.05) (Table II). 면역조직화학 염색법을 통해 gastrocnemius 근육에서의 BAX와 Bcl-2 단백질의 발현 변화를 관찰하고, 영상분석을 통해 양성반응 세포 수를 측정하여 수치화하였다. Control군의 경우 발목고정을 시행한 왼쪽 gastrocnemius 근육에서 오른쪽에 비해 BAX 단백질의 발현이 뚜렷하게 증가된 것을 관찰할 수 있었다. GB34군에서도 마찬가지로 왼쪽 근육에서 오른쪽에 비해 BAX의 발현이 증가되는 것으로 관찰되었다. 하지만 Control군에 비해 발현의 양상이 줄어든 편이었다(Fig. 2). Representative photographs of BAX immunoactivities of gastrocnemius in rats of Control and GB34 Groups. In Control group, the immunoreactivities of BAX protein in left gastrocnemius muscle were increased significantly to compared with right muscle. In GB34 group, the immunoreactivities of BAX also increased in left gastrocnemius muscle to compared with right muscle. However, the expressions on the left gastrocnemius of GB34 group were less than the left gastrocnemius muscle of the Control group. Scale bar=100 μm. 200 magnification. BAX의 발현 정도를 정량화하기 위해 양성반응 세포 수를 측정하여 수치화한 결과에서도, Control군의 경우 아무런 처치도 가하지 않은 오른쪽에서 단위면적당 평균 15.6±4.7개/105 μm2, 발목고정을 시행한 왼쪽에서는 30.5±6.7개/105 μm2로 유의성 있는 증가를 나타내었다(p<0.01). GB34군의 경우에서도 오른쪽에서 평균 14.4± 4.9개/105 μm2, 왼쪽에서는 22.9±6.6개/105 μm2로 관찰되어 Control군에서도 마찬가지로 유의성 있는 발현 증가를 나타내었다(p<0.01). Control군과 GB34군을 비교한 결과에서는 오른쪽 gastrocnemius에서는 두 군 간에 발현의 차이를 나타내지 않았으나, 왼쪽 근육에서는 GB34군이 Control군에 비해 유의성 있는 발현 감소가 관찰되었다(p<0.05) (Table III). BAX Immunoactivities of Gastrocnemius Muscles in Rats of Control and GB34 Groups.. Values are presented as mean ± standard deviation unless otherwise indicated (counts/105 μm2)..
Bcl-2 단백질의 경우에는 현미경으로 관찰한 결과, Control군과 GB34군 모두에서 발목고정을 시행한 왼쪽 gastrocnemius에서 아무런 처치도 가하지 않은 오른쪽에 비해 면역 반응이 증가되는 것으로 관찰되었다. 오른쪽에 대한 왼쪽 근육에서의 Bcl-2 면역 반응의 증가는 GB34군에서 더 뚜렷이 관찰되었다(Fig. 3). Representative photographs of Bcl-2 immunoactivities of gastrocnemius in rats of Control and GB34 Groups. The immunoreactivities of Bcl-2 protein in left gastrocnemius muscle were increased significantly to compared with right muscle in both Control and GB34 groups. The expressions on the left gastrocnemius of GB34 group were observed more than left muscle of the Control group. Scale bar=100 μm. 200 magnification. 양성반응 세포 수를 측정하여 수치화한 결과에서는, Control군의 경우 아무런 처치도 가하지 않은 오른쪽에서 단위면적당 평균 17.2±4.8개/105 μm2, 발목고정을 시행한 왼쪽에서는 24.2±5.8개/105 μm2로 유의성 있는 증가를 나타내었다(p<0.01). GB34군의 경우에서도 오른쪽에서 평균 16.1±4.5개/105 μm2, 왼쪽에서는 29.6±4.9개/105 μm2로 관찰되어 Control군에서도 마찬가지로 유의성 있는 발현 증가를 나타내었다(p<0.05). Bcl-2 발현의 정도를 Control군과 GB34군에서 비교한 결과에서는 오른쪽 gastrocnemius에서는 두 군 간에 차이를 나타내지 않았으나, 왼쪽 근육에서는 GB34군이 Control군에 비해 발현이 더 증가되어 유의성 있는 차이를 나타내었다(p<0.05) (Table IV). 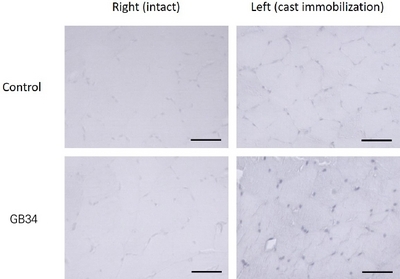 Bcl-2 Immunoactivities of Gastrocnemius Muscles in Rats of Control and GB34 Groups. 비복근(gastrocnemius)은 발목관절의 바닥쪽굽힘(plantar flexion)을 일으키는 주요 근육으로써, slow와 fast myosin-heavy chain을 모두 함유하고 있다. 불용성 근위축은 주로 여러 근섬유 유형이 혼합된 근육에서 유발되는데, 따라서 실험적으로 근위축 연구에 gastrocnemius를 흔히 사용하게 된다20). 본 연구에서는 불용성 근위축에 대한 양릉천 자침의 보호효과를 검증하기 위해 붕대고정의 방법을 시행하여 근위축을 유발하였다. 붕대고정에 의한 실험적 불용성 근위축 유발은 실제 임상에서 수술 후의 오랜 침상생활 혹은 노년층의 근육 불사용 등의 원인에 의해 나타나는 근위축을 연구하기 위한 효과적인 방법이다18). 2주간 왼쪽 발목관절을 고정시킨 실험 동물의 체중 변화는 Control군과 GB34군 사이에 유의성 있는 차이는 발견되지 않았다. 하지만 2주 후 각 실험 동물의 gastrocnemius 근육을 적출하여 중량을 비교한 결과에서는 붕대고정을 시행한 왼쪽 gastrocnemius의 중량이 자유롭게 움직임이 가능하게 한 오른쪽에 비하여 중량이 현저히 감소되는 결과를 보였다. 즉 Control군의 경우 왼쪽이 오른쪽에 비해 근육 중량이 약 25.0% 감소되었으며, 양릉천 자침을 시행한 GB34군의 경우는 약 19.0% 감소되는 결과를 나타내었다. 두 군 간의 감소율 비교에서는 GB34군이 Control군에 비해 중량 감소가 완화된 결과를 나타냈다. 이러한 결과는 양릉천 자침이 불용성 근위축 손상에서 근육의 중량 감소에 대해 유의한 보호효과를 가지고 있음을 보여주는 것이라 할 수 있다. 이후 채취된 gastrocnemius를 8 μm 두께로 냉동절편하여 H&E 염색을 통해 현미경하에서 근육 단면을 관찰하였다. 그 결과, Control군과 GB34군 모두에서 붕대고정을 시행한 왼쪽 gastrocnemius 근섬유의 크기가 오른쪽에 비해 감소되었으며 주변의 핵응집이 다수 발견되었다. 근위축이 일어난 왼쪽 근육만을 비교했을 경우에는 GB34군에서 Control군에 비해 상대적으로 근섬유 크기의 감소가 완화되었으며 핵응집도 상대적으로 적게 관찰되었다. 영상분석을 통해 실제 근섬유 절단면에서의 단면적의 크기를 측정하여 비교한 결과에서도 Control군이 붕대고정을 시행한 왼쪽에서 오른쪽에 비해 19.7%의 감소율을 나타낸 반면, GB34군에서는 15.6%로 관찰되어 GB34군이 Control군에 비해 근육위축이 유의성 있게 회복된 결과를 나타냈다. 다시 말해, 양릉천 자침은 근육의 불사용으로 인한 gatrocnemius의 중량 감소에 대한 보호작용뿐 아니라, 근섬유의 단면적 감소에도 유의한 방어효과를 가지고 있는 것으로 확인되었다. 근육에서의 다양한 병리적 상황에서 근육세포의 apoptosis가 증가하는 것으로 알려져 있으며, 골격근 위축에서도 apoptosis 기전이 중요한 역할을 하는 것으로 밝혀졌다7). 실험 동물의 후지고정으로 유발된 근위축에서도 apoptosis가 관여하고 있음이 보고되었으며, 본 연구에서는 발목관절의 붕대고정에 의한 apoptosis의 발생 여부와 그 정도를 확인하기 위하여 관련 단백질의 발현 변화를 관찰하였다. Apoptosis와 관련된 여러 가지 단백질 중에 BAX와 Bcl-2의 발현은 proapoptic mechanism을 유발과 억제를 측정하는 데 주로 사용된다21). 이전 연구에 따르면, 근육의 불사용으로 유발시킨 실험적 근위축 손상의 과정에 apoptotic DNA fragmentation의 증가와 proapoptotic BAX의 증가가 확인되었다8). 또한 antiapoptotic Bcl-xL 단백질의 변화도 보고되었는데, Bcl-2의 경우 근위축 초기에 감소되지만 이후에는 상대적으로 증가되는 것으로 보고되었다22). 즉 pro-apoptotic protein인 BAX와 anti-apoptotic protein인 Bcl-2의 국소적인 비율이 세포사를 결정하는 데 있어 중요한 역할을 한다. 본 연구에서는 gastrocnemius 근육의 위축변화에 있어 BAX와 Bcl-2 단백질의 발현 변화를 관찰하기 위하여 면역조직화학염색법을 시행하고 현미경하에서 관찰한 결과, BAX의 경우 Control군과 GB34군 모두에서 붕대 고정을 시행한 왼쪽에서 오른쪽에 비해 BAX 단백질의 발현이 뚜렷하게 증가되는 것이 관찰되었다. Bcl-2 단백질의 경우에도 Control군과 GB34군 모두에서 발목고정을 시행한 왼쪽에서 아무런 처치도 가하지 않은 오른쪽에 비해 면역 반응이 증가되는 것으로 관찰되었다. 이러한 결과는 실험 동물에 인위적인 불용성 근위축 유발 이후에 근육 내의 apoptosis 관련 BAX와 Bcl-2 단백질이 증가한다는 이전 연구 결과23)와도 일치하는 것이며, 본 연구에서 발목관절에 붕대고정을 시행한 불용성 근위축 기전에 apoptosis가 관여하고 있음을 보여주는 것이라 할 수 있다. 근위축이 일어난 왼쪽 gastrocnemius에서 Control군과 GB34군 사이의 BAX와 Bcl-2의 발현을 현미경하에서 비교했을 때에는, BAX의 경우 GB34군에서 Control군에 비해 발현이 줄어드는 경향이 관찰되었으며, Bcl-2는 GB34군에서 Control군에 비해 발현이 증가되는 경향이 있는 것으로 관찰되었다. 현미경하에서 관찰된 이러한 결과들을 정량적으로 수치화하기 위하여 영상분석을 통해 면역반응에 양성반응을 보인 세포 수를 측정하였다. 그 결과, BAX의 경우 오른쪽 gastrocnemius에서는 두 군 간에 차이가 나타나지 않았으나, 왼쪽 gastrocnemius에서는 GB34군이 Control군에 비해 면역양성반응 세포 수가 감소되어 유의성 있는 차이를 나타내었다. 반면에 Bcl-2의 경우, 오른쪽 gastrocnemius에서는 마찬가지로 두 군 간에 차이가 나타나지 않았으나, 왼쪽 gastrocnemius에서는 GB34군이 Control군에 비해 면역양성반응 세포 수가 오히려 더 증가되어 유의성 있는 차이를 나타내었다. Bax/Bcl-2 ratio를 계산한 결과에서도 오른쪽 gastrocnemius의 경우 Control군에서 0.91, GB34군이 0.89의 값으로 측정되어 큰 차이를 나타내지 않았으나, 왼쪽의 경우에는 Control군이 1.26, GB34군이 0.77의 값으로 측정되어 뚜렷한 감소를 나타내었다. 이러한 결과들은 양릉천 자침이 발목관절 고정으로 유발된 근육의 불용성 위축의 apoptosis 기전에서 이를 촉진하는 BAX 단백질의 발현을 감소시키는 동시에, apoptosis를 억제하는 Bcl-2 단백질을 더욱 증가시킴으로써 결과적으로 apoptosis 과정을 억제하는 효과를 나타낸 것으로 생각할 수 있다. 이러한 기전을 통해 불용성 근위축에 보호효과를 갖는 것으로 사료된다. 종합하면, 2주간 흰쥐 오른쪽 발목관절을 붕대 고정하여 유발시킨 불용성 근위축에 대하여 양릉천 자침은 gastrocnemius 근육의 중량 감소와 근섬유 단면적 감소에 유의한 방어 작용을 나타내었다. 이러한 방어 작용의 기전은 apoptosis 관련 단백질, 즉 BAX, Bcl-2의 발현비율을 조절함으로써 불용성 근위축을 억제하는 효과를 갖는 것으로 사료된다. 다만, 본 연구에서는 양릉천 자침이 apopotosis 기전에 미치는 영향만을 관찰하였으나, 추후 지속적인 연구를 통해 다른 유형의 근위축 모델과 그 발생 기전에 미치는 영향에 대해서도 후속 연구가 필요할 것으로 사료된다. 본 연구는 불용성 근위축 손상에서 양릉천 자침이 미치는 효과를 검증한 것이다. 흰쥐의 발목관절을 2주간 붕대 고정하여 근육 불사용을 유도하고 매일 양릉천 혈에 자침하여 체중 변화, gastrocnemius 근육의 중량, 근섬유 단면적 변화, 그리고 apoptosis 관련 단백질의 변화를 관찰한 결과, 다음과 같은 결론을 얻었다. 양릉천 자침은 근육 미사용으로 인한 실험 동물의 체중 변화에는 별다른 영향을 미치지 않았으나, gastrocnemius 근육 무게의 감소를 완화시켜 주는 효과가 있었으며 동시에 근섬유의 단면적 감소를 억제시키는 것으로 확인되었다. 무게와 단면적 크기의 변화가 나타난 gastrocnemius에서 BAX 단백질의 발현을 감소시키고 동시에 Bcl-2의 발현을 증가시킴으로써 apoptosis 과정을 억제하는 효과를 나타내는 것으로 밝혀졌다. 이와 같은 결과로 양릉천 자침은 불용성 근위축 손상에 유의한 보호효과가 있는 것으로 사료된다. Wall BT, and van Loon LJ. Nutritional strategies to attenuate muscle disuse atrophy. Nutr Rev 2013;71:195-208. Wall BT, Dirks ML, and van Loon LJ. 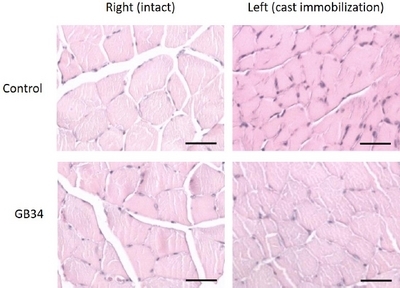 Skeletal muscle atrophy during short-term disuse: implications for age-related sarcopenia. Ageing Res Rev 2013;12:898-906. Valenzuela PL, Morales JS, Pareja-Galeano H, Izquierdo M, Emanuele E, de la Villa P, and Lucia A. Physical strategies to prevent disuse-induced functional decline in the elderly. Ageing Res Rev 2018;47:80-8. Pileggi CA, Hedges CP, D&apos;Souza RF, Durainayagam BR, Markworth JF, Hickey AJR, Mitchell CJ, and Cameron-Smith D. Exercise recovery increases skeletal muscle H2O2 emission and mitochondrial respiratory capacity following two-weeks of limb immobilization. Free Radic Biol Med 2018;124:241-8. Kozakowska M, Pietraszek-Gremplewicz K, Jozkowicz A, and Dulak J. The role of oxidative stress in skeletal muscle injury and regeneration: focus on antioxidant enzymes. J Muscle Res Cell Motil 2015;36:377-93. Hu NF, Chang H, Du B, Zhang QW, Arfat Y, Dang K, and Gao YF. Tetramethylpyrazine ameliorated disuse-induced gastrocnemius muscle atrophy in hindlimb unloading rats through suppression of Ca2+/ROS-mediated apoptosis. Appl Physiol Nutr Metab 2017;42:117-27. Siu PM, Pistilli EE, Butler DC, and Alway SE. Aging influences cellular and molecular responses of apoptosis to skeletal muscle unloading. Am J Physiol Cell Physiol 2005;288:338-49. Siu PM, Pistilli EE, and Alway SE. Apoptotic responses to hindlimb suspension in gastrocnemius muscles from young adult and aged rats. Am J Physiol Regul Integr Comp Physiol 2005;289:1015-26. Textbook Committee of Korean Acupuncture and Moxibustion Society. The Acupuncture and Moxibustion. Seoul: Jipmoondang; 2001 p. 382-4. Watson P. Modulation of involuntary movements in cerebral palsy with acupuncture. Acupunct Med 2009;27:76-8. Kwon HY, and Kim JH. The effects of Yanggnungchon(G34) acupuncture on the muscle fatigue. Korean Journal of Acupuncture 2008;25:115-23. Youn DH, You PS, Kim WI, Kim MR, Choi DH, and Na CS. Effects of laser acupuncture therapy according to the wavelength at GB34⋅GB39 on neuropathic pain rat induced by tibial and sural nerve transection. Korean Journal of Acupuncture 2014;31:195-207. Wang JY, Gao YH, Qiao LN, Zhang JL, Duan-Mu CL, Yan YX, Chen SP, and Liu JL. Repeated electroacupuncture treatment attenuated hyperalgesia through suppression of spinal glial activation in chronic neuropathic pain rats. BMC Complement Altern Med 2018;18:74-84. Lee JT, Lee BR, Yang GY, Lee HY, and Yim YK. A study on the effect of herbal-acupuncture with Artemisiae Capillaris Herba at GB34 on hyperlipidemia in rat. Korean Journal of Acupuncture 2010;27:107-23. Kim BS, Lee HY, and Yim YK. The effect of electro-acupuncture at ST36 on carbon tetrachloride-induced chronic hepatic damage in rats. Korean Journal of Acupuncture 2015;32:90-8. Jung JC, Kim KH, Park YC, Kim HB, Lee SH, Chang DI, and Lee YH. The study on the effect of acupuncture on UPDRS and heart rate variability in the patients with idiopathic parkinson&apos;s disease. The Acupunct 2006;23:143-53. So RC, Ng JK, and Ng GY. Effect of transcutaneous electrical acupoint stimulation on fatigue recovery of the quadriceps. Eur J Appl Physiol 2007;100:693-700. Udaka J, Terui T, Ohtsuki I, Marumo K, Ishiwata S, Kurihara S, and Fukuda N. Depressed contractile performance and reduced fatigue resistance in single skinned fibers of soleus muscle after long-term disuse in rats. J Appl Physiol 2011;111:1080-7. Tanahashi N, Shikami J, Yoneda M, and Ishida T. Effects of manual acupuncture at GB34 on carbon tetrachloride- induced acute liver injury in rats. J Acupunct Meridian Stud 2011;4:214-9. Matsumoto Y, Nakano J, Oga S, Kataoka H, Honda Y, Sakamoto J, and Okita M. The non-thermal effects of pulsed ultrasound irradiation on the development of disuse muscle atrophy in rat gastrocnemius muscle. Ultrasound Med Biol 2014;40:1578-86. Lee G, Lim JY, and Frontera WR. Apoptosis in young and old denervated rat skeletal muscle. Muscle Nerve 2017;55:262-9. Zhang SF, Zhang Y, Li B, and Chen N. Physical inactivity induces the atrophy of skeletal muscle of rats through activating AMPK/FoxO3 signal pathway. Eur Rev Med Pharmacol Sci 2018;22:199-209. Alway SE, Bennett BT, Wilson JC, Sperringer J, Mohamed JS, Edens NK, and Pereira SL. Green tea extract attenuates muscle loss and improves muscle function during disuse, but fails to improve muscle recovery following unloading in aged rats. J Appl Physiol 2015;118:319-30.